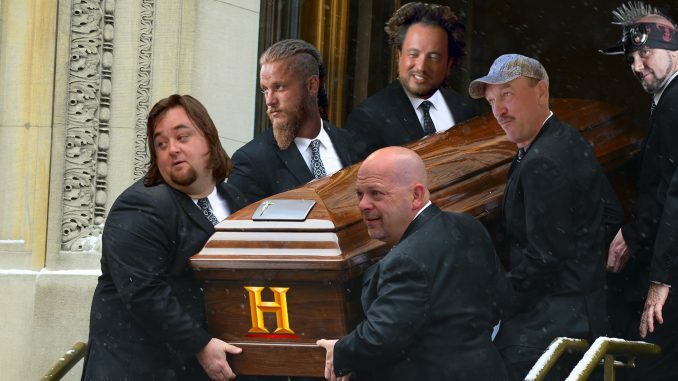 NEW YORK—The History Channel venerated the ending of the network’s actual history programming in a ceremony Wednesday. The somber event was attended by the stars of History’s current lineup of popular-but-not-history-related reality and dramatic shows. The VHS tapes of past shows like World War II documentaries, Vietnam in Color, and Modern Marvels, along with a resigned Ken Burns were loaded into a mahogany coffin. After a brief memorial service, the coffin was taken to Woodlawn Cemetery and buried. Some of the stars resented the implication that their shows were less august than the more academic programming that the network had been built upon. “People would rather watch Chumlee annoy me with his idiotic hijinx than sit and listen to a talking head drone on about the history of federalism,” Pawn Star Rick Harrison said with his trademark wheezy chuckle.